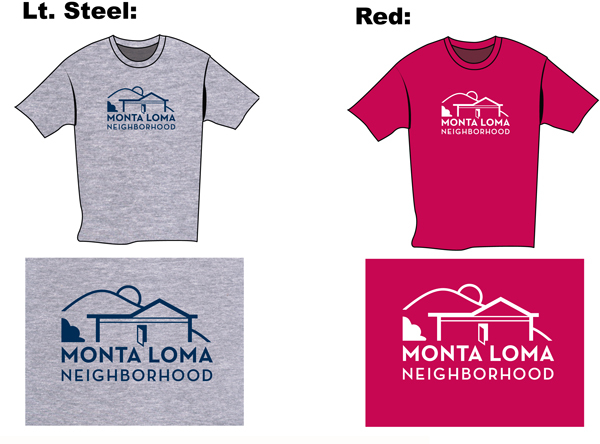 Show your pride in our neighborhood by wearing a Monta Loma tee shirt. Some red shirts and gray shirts ordered for sale at the Ice Cream Social are still available. Three adult styles are available, but only in Light Steel or Deep Red. Click on each style for a photo. Also available are two shirts with the old Dancing People logo in size Youth Extra Small in Light Steel, and one old-logo shirt in Navy, size XXL. To inquire about any of these remaining shirts, open an email message to Marilyn (or, if you’re using a webmail service, send an email to marilyn@gildea.com).